We are used to going to Web of Science to see how many times a particular paper has been cited but if you haven’t used the database in a while, you may not have noticed that they added alternative metrics. Usage counts are now provided that add up the number of times the full text links of a paper have been clicked, and the number of times that it has been saved for use in a bibliographic management tool. Counts are provided from the last 180 days or since since February 1, 2013. For more info on impact measurements, visit our guide. The first edition of the list of 382 Highly Cited Researchers (h>100) according to Google Scholar Citations includes two McGill scientists: Alan Evans has an h-index of 152, putting him at #34 in the list, and Andreas Warburton is #99 with an h-index of 128. Alan Evans is no stranger to citation fame, as he was also included in the 2014 Highly Cited Researchers list from Thomson Reuters, along with Chemistry professor, Chao-Jun Li (read more on this from McGill News and Events). 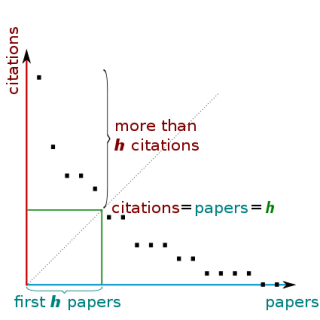 The h-index marks the place where the number of citations a researcher receives meets the number of papers they have published (see the graph below). Read more about the h-index from Hirsch’s article in arXiv. You can create your own citations page in Google Scholar by looking for the “My Citations” option. When it comes to evaluating scientific papers, citation counts are mentioned more often than not. A paper can be cited for a variety of reasons but it is generally agreed that citations are one of many indicators of impact. There are a number of resources that are either free or subscribed to by the Library for looking up citing references, such as Google Scholar, Scopus, and Web of Science. The authors of The Wisdom of Citing Scientists discuss the limitations of citing references for assessing the usefulness of papers. For example, one cannot assume that a paper with few citations has been widely read and critiqued. 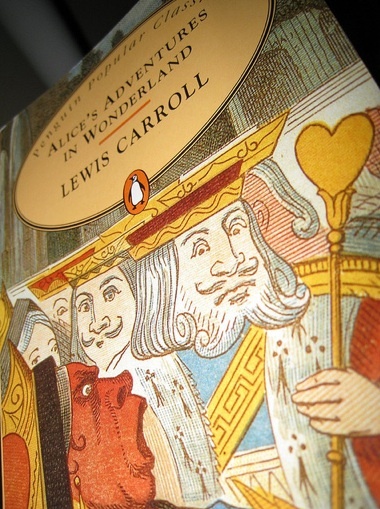 It is possible that the paper was not found by others or that it did have some influence on future writings. They argue that cited references in a paper tell a more complete story, revealing a scientist’s preference for particular journals and theoretical approaches, and his/her ability to identify relevant, current, and high quality publications. As librarians we are always stressing the importance of examining the reference list of a paper so it was quite nice to see this articulated. The “Cited by” option in Google Scholar now includes a link to citations in Web of Science. Take a look under the reference to the article in this screen shot. Google found 7289 citations from all sorts of items on the web, but also links to the 701 citing articles in the multidisciplinary database, Web of Science. I was using Google Scholar today to send references over to EndNote but this is a nice new feature that I will be sure to explore further. We have blogged in the past about metrics for measuring impact, such as the well known Journal Impact Factor, and more recently Altmetric, so I thought that I would bring your attention to Google’s lists of top publications. As part of the Google Scholar Metrics offerings they have rankings of the top 100 publications in several languages. Google has added categories and subcategories for the English language rankings, so now you can look up the top publications in, for example, Geophysics in the Physics & Mathematics category, or Robotics in the Engineering & Computer Science Category. The usual suspects are there in the list, like Science, Cell, Nature, Physical Review Letters, but you may find some interesting results. How amazing is it that arXiv (open access e-prints in physics, mathematics, computer science) is frequently listed by the separate subject areas? 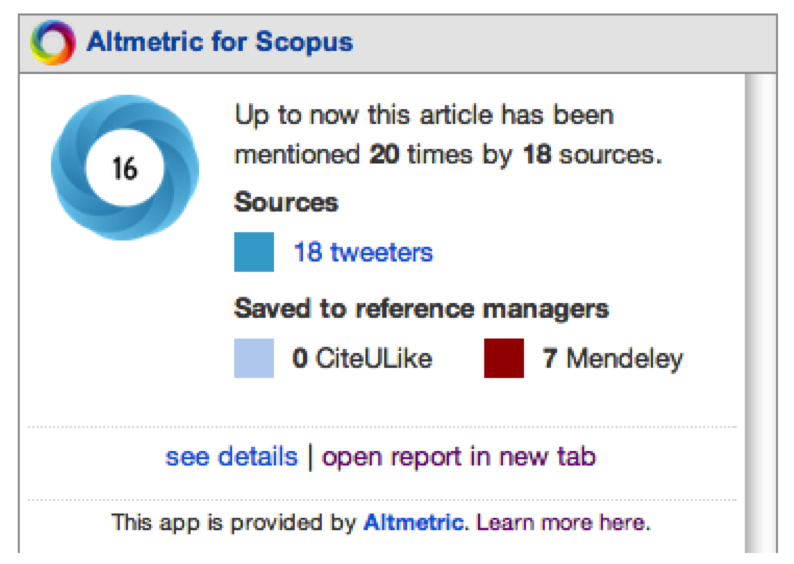 The next time that you find an article of interest in the Scopus database, click on the title and look for this Altmetric for Scopus box. The article will get a score, based on how much attention or buzz it is getting online. For example, this article was mentioned by 18 tweeters and was saved by seven individuals to their Mendeley references. You can read the tweets and see how many of them are coming from the general public, versus scientists, practitioners, or journalists and bloggers. The app will also tell you how the article ranks and if the Altmetric score is good compared to other articles that came out around the same time and from the same journal. Alternative metrics like these are great for going beyond the standard citation count, h-index, or journal impact factor, and can provide some realtime feedback. There is no shortage of university rankings to be found on the Internet but I’d be hard pressed to find one as inclusive as the Webometrics Ranking, or as dedicated to self-improvement. The ranking, produced by Cybermetrics Lab (a research group of the Spanish National Research Council), covers more than 20 000 universities worldwide. They designed indicators of impact (links in to the university domain from third parties), presence (university pages found in Google), openness (files found in Google Scholar, including PDFs and other files from a university’s repository), and excellence (highly cited papers in scientific fields). It is quite an interesting methodology. Do you love trailers as much as we do at The Turret? This one is advertising the Impact Measurements Demystified webinars that begins next Tuesday at lunch hour. I was browsing through the latest issue of Science and poking around its website when I discovered a video about the Science Hall of Fame. This hall of fame lists approximately 4,000 scientists whose names have appeared the most frequently in books over the centuries. According to John Bohannon, one of the creators of the Science Hall of Fame, the data used to compile the list provides a few unexpected career tips for individuals who wish to be famous among the popular masses. One of these tips is to write a best-selling book. 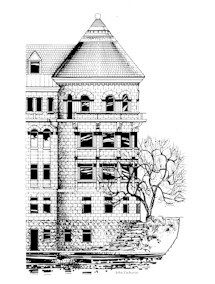 Read Bohannon’s article for all the details.